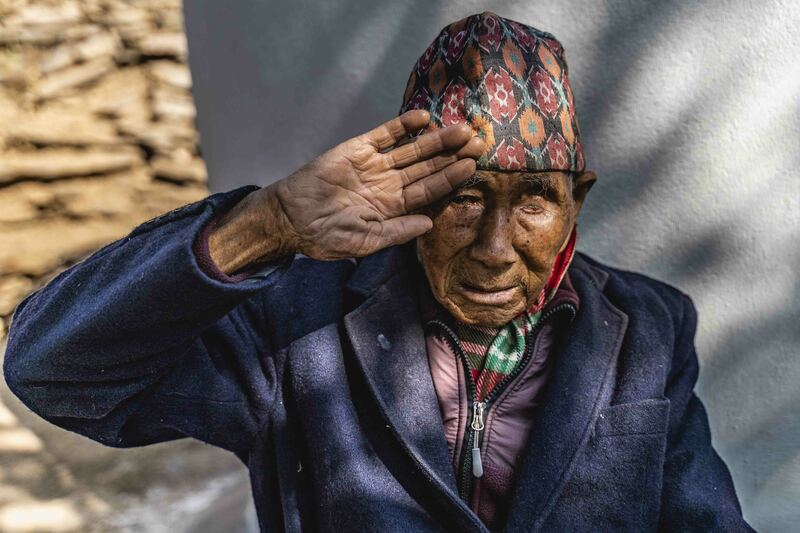 When Gurkha veteran Rifleman Hauda Thapa returned from the army to Nepal back in 1946 he struggled to get by and spent most of his days farming to make ends meet. Indeed, he still boasts a small selection of livestock today; one buffalo, two calves and two goats. Though it’s his daughter-in-law and his grandaughters who look after the animals now. The path of subsistence farming is something we hear a lot from our Gurkha pensioners. Returning to a country without much industry after serving in the forces, many veterans found it a full-time job just to farm enough food to support their families. Hauda enlisted in the Gurkhas in 1941 during World War Two and was released when the British Army downsized after the war in 1946. He is emotional when recalling his time in the Army, as well as what came next. With no British Army pension, we pay Hauda a Welfare Pension in recognition of his amazing service. We have been working on a pilot project for Hauda to ensure he has a constant supply of fresh clean water in his home. Hauda’s home is in a small village in the Tanahun district of Nepal around two hours away (by vehicle) from our nearest Welfare Centre. During the dry season (December to February) the road to his village is almost unnavigable owing to the dust clouds it kicks up, which makes it especially difficult for our staff visiting on motorbikes! It’s not just travel which becomes difficult during the dry season. Whole communities find themselves relying on very limited shared water sources with the brooks and wells drying up. 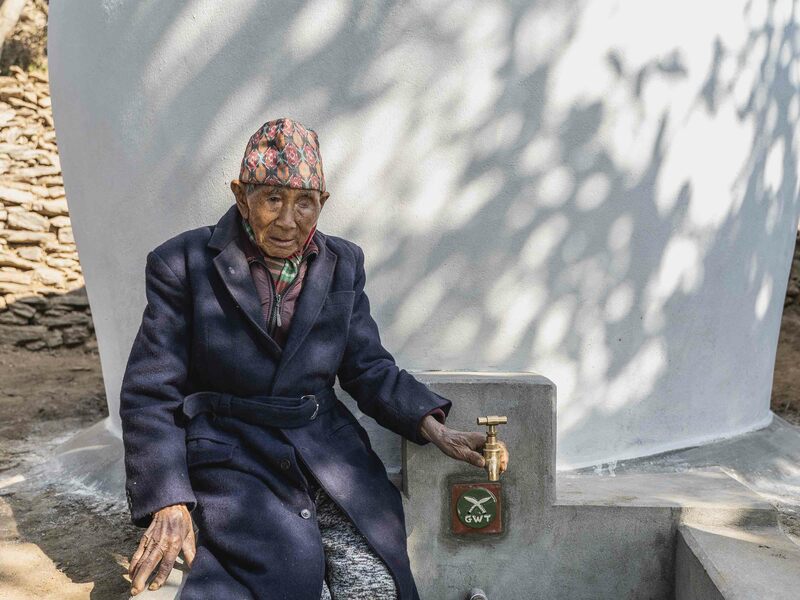 A recent survey of Gurkha veterans and widows living in the region found that almost 30% of them had no immediate access to running water at all. Though we have vast experience working with whole communities on larger projects to pipe in fresh water, where that’s not possible we want to begin harnessing rainwater to provide some of our most vulnerable pensioners with safe and easy access to drinking water. We used Hauda’s situation as a pilot. Our first step was to construct a ferro cement house adjacent to his home. As you can see from the images, the process takes time and for the whole tank to set took 28 days, with the unit wrapped with wet blankets the entire time. The tank capacity is an incredible 6,500 litres. Health experts recommend that you drink at least two litres of water every day, so by our calculations a full tank means that he’ll have enough to drink until he’s 104! 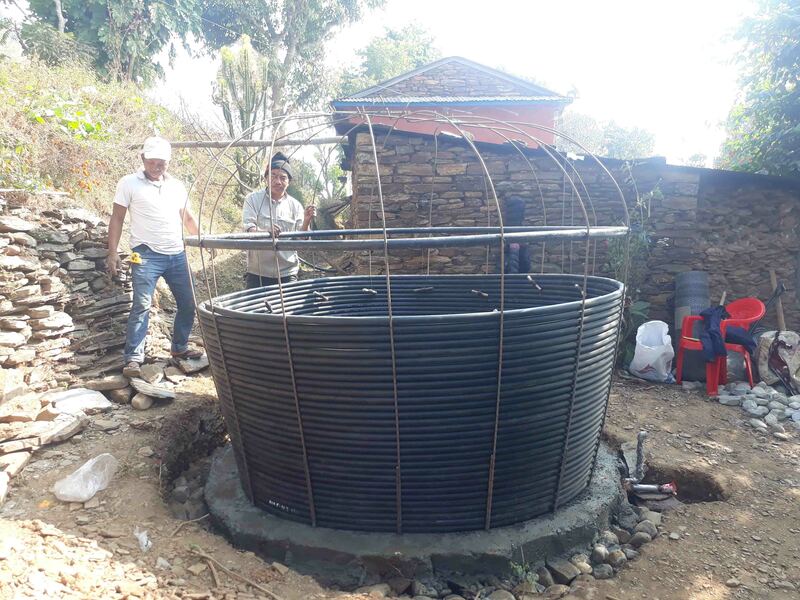 Of course, it doesn’t work like that in practice – the water will be used for various functions but, given the monsoon rains that happen in Tanahun each year, we know that the system is entirely renewable. Hauda and his family will never go without. Our next step was to install a sophisticated water filtration system, to ensure that the water is entirely safe for human consumption. With your help, we are confident we can begin installing other systems like these to other Gurkha veterans and widows in Nepal. Our pilot project has taught us a lot. 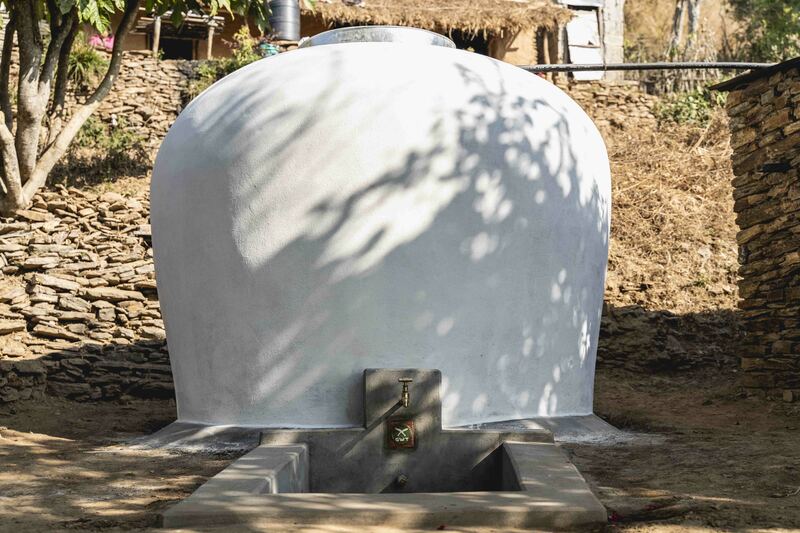 We think that with a few tweaks, such as the use of pre-constructed polythene tanks we can roll out systems like this across Nepal cheaply and effectively. To do that, we need your help. Hauda is delighted with his new system. Help us continue to support brave Gurkha veterans like Hauda Thapa by donating to our work.